Although cats have a reputation for being aloof, unfriendly, and even jerk-ish, the truth is quite different. Your pet cat is probably friendly, playful, and even loyal. It may be on their terms, but the love is there. The question is how to help two cats get along. 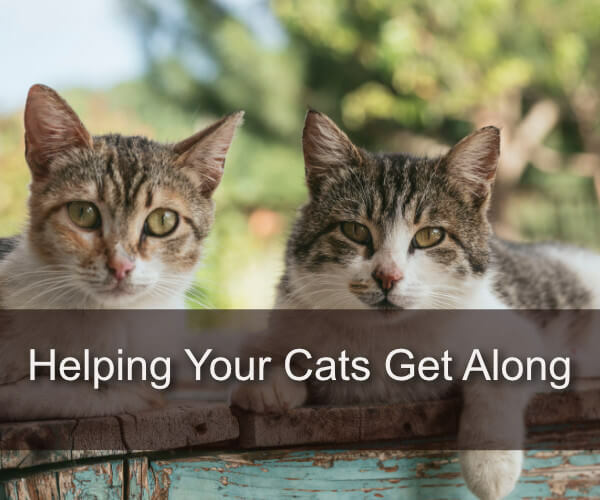 Because these animals can be very territorial, introducing a new cat – or even dealing with two cats that have lived together for a while – can cause problems. There are a variety of ways to help two – or more – cats get along. It may take a trip to the veterinarian, a period of introduction, or other steps. Here are some things try! Hormones can wreak havoc on everyone (teenagers, anyone?) Your cats are far from immune from their influence. If a cat isn’t spayed or neutered, they can become extremely aggressive. Not being “fixed” can cause cats to spray in order to mark territory, fight other animals, and even attack their owners. The energy from a cat that has these issues can affect every animal in the home, especially other cats. There are tons of health reasons to get your cats fixed. Add dozens of behavioral reasons as well, and there’s no excuse. Get to your Little Rock veterinarian and get the cats spayed or neutered! A male cat that you believe is neutered should still be checked at a veterinarian if they are aggressive. They may have excess hormones from an incomplete operation. Have it checked out! Sometimes cats are nervous or upset can take it out on other cats in the home, even though the other animal is not the culprit. If you notice your cat marking or fighting and there are no hormonal issues found by your veterinarian, it’s time to check the territory. Your cats consider your home their safe space, and if something threatens it the cats act out. Other cats or animals outside windows, doors, or even in your yard can cause tremendous anxiety. You might consider setting up motion-activated air or water deterrents outside those areas. When the threats are gone, you’ll be amazed at how much happier your cats are! Sometimes competing cats need to be brought together with positive experiences. Many times cats create a relationship based on fighting, chasing, hissing, and more. Unless something different is introduced, that dynamic will continue. It would be best if a new cat was introduced correctly from the beginning, but if that didn’t happen all hope is not lost. Simply start over and give those positive experiences! This generally includes feeding, where both cats eat on opposite sides of a barrier. Depending on the level of aggression, you might start with them not being able to see each other, then able to see, then finally without a barrier. When your cats associate each other with positive events like eating, they’ll start to get along a lot better. Sometimes there’s an imbalance or medical issue that causes cats to be aggressive. If you’ve tried all the tips in this article and nothing has worked, bring your cat to your Little Rock veterinarian for an exam. We can look over your furry friend, run a variety of tests, and get results quickly due to our in-house laboratory. We’d love to help you determine what’s at the root of your cat’s behavior. Feel free to contact us any time!